The Forum in ca. 310 AD. View from the south-east. The Forum in ca. 310 AD. View from the east. The Forum in ca. 310 AD. View from the north-east. The Forum in ca. 310 AD. View from the north-west. The Forum in ca. 310 AD. View from the west. The Forum in ca. 310 AD. View from the south. The Forum in ca. 310 AD. Topographical overview. The Forum in ca. 310 AD. View from above. 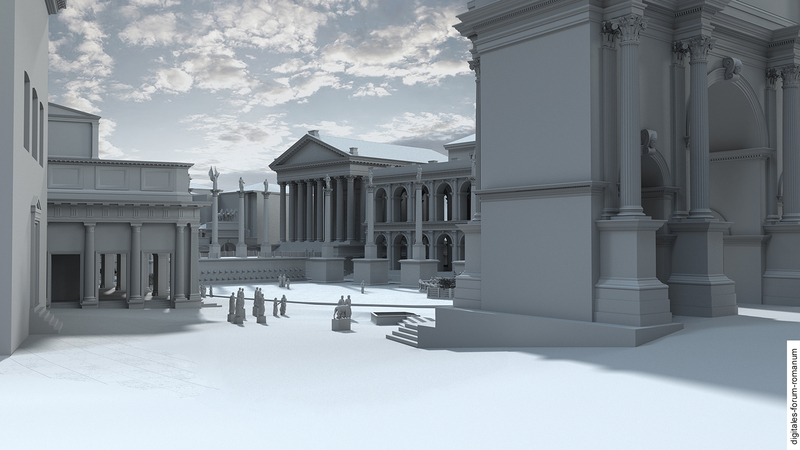 In 310 A.D. the Forum Romanum had strongly changed in appearance. Yet again the square had been reinvented with regard to its architectural composition – and this to a similar extent to the wide-ranging changes made under Augustus (see Augustan II). Similar to the Augustan period, in which the Republic gave way to the Principate, during the Tetrarchic period, the political system of the Roman state was fundamentally redefined: Instead of a single Emperor, four rulers reigned over the Roman Empire – two upper Emperors (Augusti) and two lower Emperors (Caesares). This new system of rule, which is called the “Tetrarchy” (and the four rulers accordingly the “Tetrarchs”), was developed under Diocletian and installed in 293 A.D. after an intermediary stage in 285 A.D. in the form of a two-man-rule (“Dyarchy”). After the constant troubles that Rome experienced in domestic and foreign affairs as well as the economic uncertainties under the soldier emperors (235–284/85 A.D.), the new political order granted Rome a necessary consolidation and political stability (even if this political system was overcome in 324 A.D. and the concept of single rule re-established under Emperor Constantine, who emerged victorious from the inner struggles into which the Tetrarchy had descended since 311/12 A.D.). The transformation of the Forum into a stage of Imperial representation might, at first glance, appear to be the logical consequence of the transformation of Rome’s political system. However, similar to the transformation of the Forum under Augustus, where such a causal explanation deriving from a change to the political system does not provide us with a convincing and sufficient account (see Augustan II), the Forum under the Tetrarchy also indicates that it was a much more complex and independent process which in the end necessitated the alterations that were made to the Forum. Parallel to the developments under Augustus, the “reinvention” of the Forum was by no means foreseeable as a result of the political transitions at the beginning of the Tetrarchy. On the contrary: The first alterations that were made by the new rulers to the architectural substance of the Forum initially went in a wholly different direction. 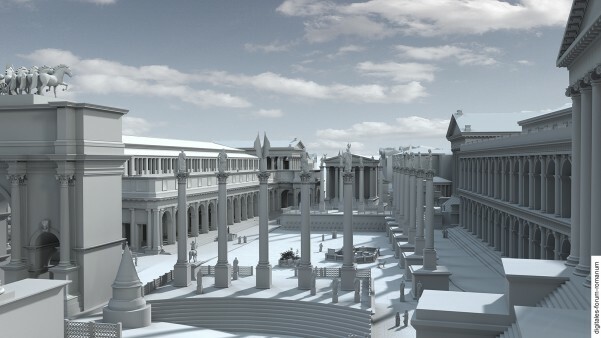 But let us start at the beginning of the story: The alterations that were made to the Forum by the Dyarchs and Tetrarchs were motivated by the widespread destruction caused by fires in 283/284 A.D., which damaged several buildings on the Forum during the rule of the Emperors Carinus and Numerianus. These fires, which had possibly been cases of arson and intentionally started during political riots in the city, especially affected the Curia and the Basilica Julia. Both buildings were destroyed and consequently rebuilt in their entirety under the Emperors Diocletian and Maximian. The old construction method was replaced with the newer brickwork technique, which allowed for the quickest possible restoration. 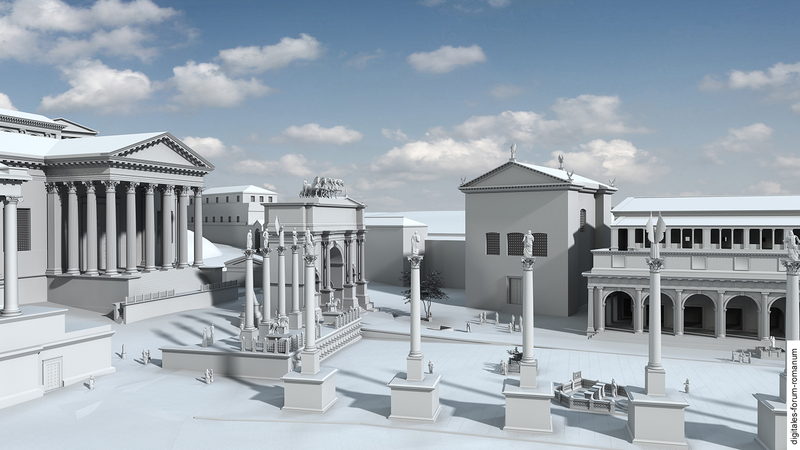 It is revealing that the restorations were heavily oriented towards the appearance of the old Augustan structures. Thus, the first alterations that were made by the Dyarchs and Tetrarchs were geared towards restoring the Forum to its old status quo. For the time being they did not seek to implement their own ideas into the restoration process. The new rulers represented themselves first and foremost as the custodians and heirs to Rome’s glorious past (just as the Severi had done before them, see Severan). 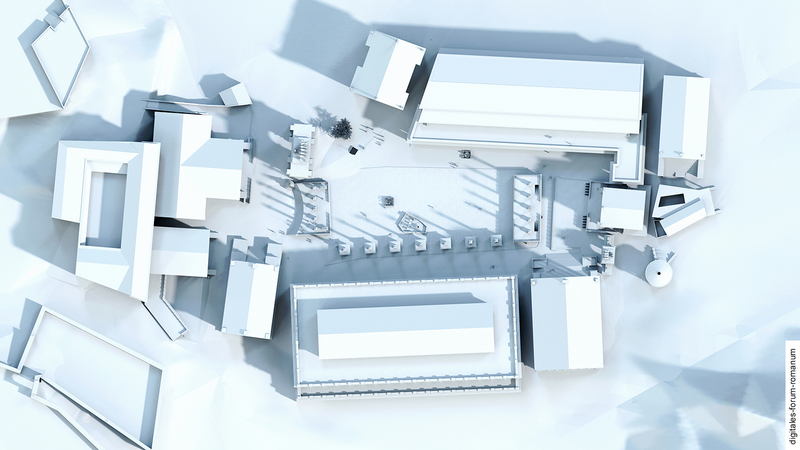 During the second phase, however, other plans were made. 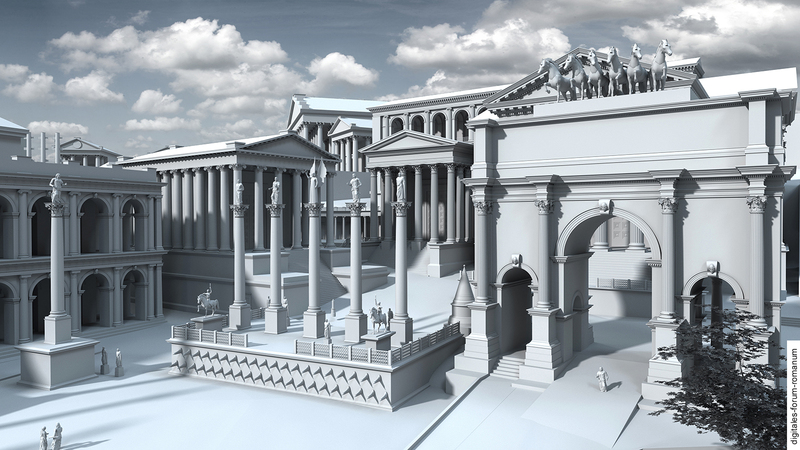 These plans aimed to establish the presence of the Tetrarchy on the Forum on a massive scale and transform the square into a place of representation for the new rulers. It is hard to tell why these plans were devised. An important moment that factored into the reshaping of the Forum seems to be the Vicennalia (the twenty-year jubilee of the Tetrarchy) in 303 A.D., which was celebrated in Rome and occasioned one of the seldom visits of the rulers to the capital of the Empire. It is certainly possible that the transformation of the Forum was planned and implemented in light of this event. It is unclear, however, who initiated this process: Was it the rulers themselves, who wanted to represent themselves adequately on the old Forum? Or was it the Roman Senate, motivated by a desire to increase its prestige and power by honoring the new rulers with spectacular monuments and thereby binding them more closely to the old capital and Imperial residence Rome? 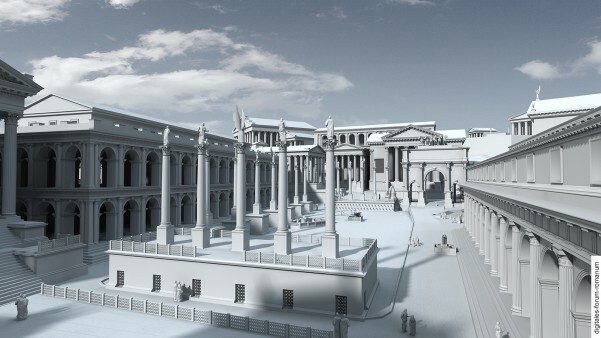 At any rate, it is a fact that the Forum square was reshaped: Five towering columns on the Rostra Augusti (which were possibly constructed by reusing an older Severan monument, see Severan) served to celebrate the political system of the Tetrarchy. On top of these columns stood the statues of Jupiter and the four genii of the Tetrarchs (as is clear from a relief on the Arch of Constantine in Rome) – it is revealing that rather than representing individual figures of the actual rulers, the abstract idea of the political system of two Augusti and two Caesares was chosen for representation. 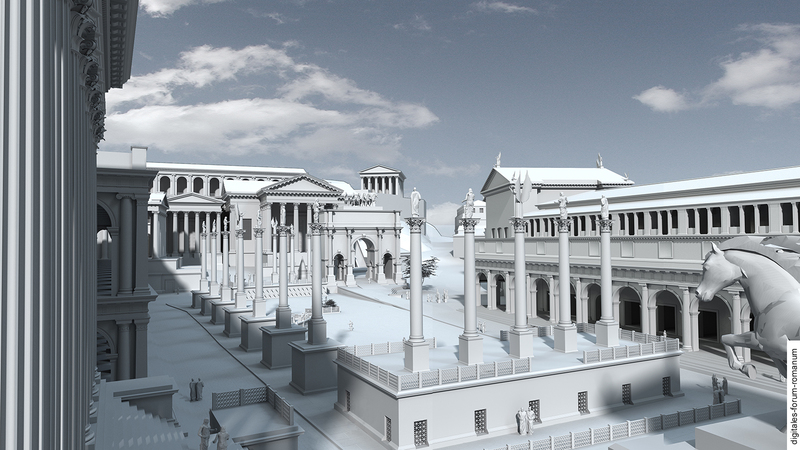 On the east side of the square, directly opposite the Rostra Augusti, a second speaker’s platform was built (Rostra Diocletiani), which heavily drew on the old Rostra Augusti for its’ architectural composition and also displayed a monument with five columns. This provided an adequate “response” to Augustus. Unfortunately, there are no sources that provide us with any information about the statuary decoration of the second column monument. It seems imaginable that the genii of the four Tetrarchs were depicted again, together with Hercules in the middle (besides Jupiter, Hercules was the second god which the Tetrarchs worshipped as a special patron god). The duplication of the Rostra and the five column monuments symbolically underscored the idea of the dual leadership of Tetrarchy with the two Augusti. As the Forum was surrounded by both of these platforms and their towering column monuments, the square was effectively transformed into a space of representation for the new political system. It remains unclear whether it had already been planned at that point to extend the line of columns along the south side of the Forum or if this happened later under Maxentius, who reigned in Rome from 306 to 312 A.D. In any case, this structural alteration was supposed to widen the representation of the Tetrarchic rulers: Seven towering honorific columns confined the Forum square on the southern edge between the Rostra Augusti and the Rostra Diocletiani. Information about the statues that adorned them is also missing. Within the historical context it seems possible to imagine that individual statues, portraying a concrete ruler, were erected here. This would have presented Maxentius, who had forced his way onto the throne (possibly by usurping it), with an ideal opportunity to legitimize his claim to power by integrating his own statue into the ranks of the first big Tetrarchs Diocletian, Maximian, Galerius and Constantinus. Whatever the motives and intentions were behind these seven column monuments, the consequences for the physiognomy of the Forum remain the same: Where once the open Forum square had lain for many centuries, bordered by towering architecture that had defined its limits, there now stood a very narrow square, enclosed by a group of towering columns. This group of honorific columns stood in front of the architecture of the surrounding buildings and transferred them to the second row. Thus, the past was relegated to the periphery of the Forum and the present was symbolically placed in the foreground at the center. What is striking about the Forum’s metamorphosis is this: The fourth side of the square, facing the north, remained free, although one could have easily erected further honorific columns there. In this way, the north side of the square obtained a special accentuation, effectively opening a new spatial dialogue between the Forum square, with its Rostra and the Comitium, and the newly built Curia. 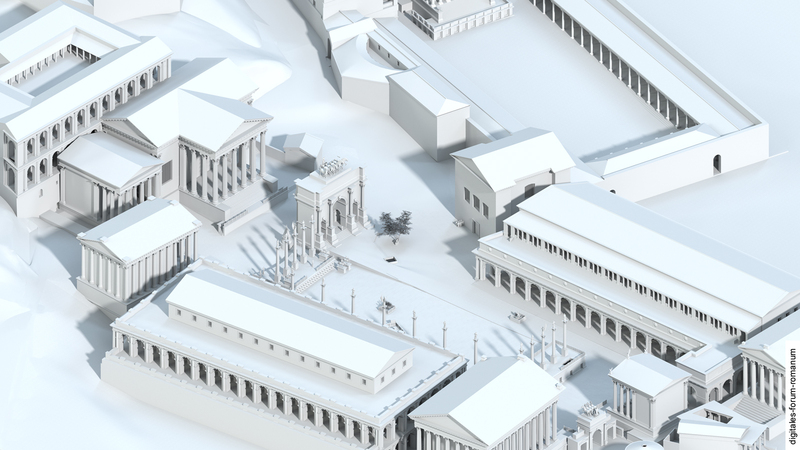 Ever since the transformation of the Forum under Augustus, both spaces, the Forum square and the Comitium, had been visually separated by the road that ran between them. Through the new column groups, which were situated on all the other three sides of the square, both of these older spaces were related to one another more closely – so that the Rostra, as a place of Imperial representation, and the Curia, as the seat of the venerable Senate, were able to engage in a lively and ideological dialogue again: Senate and Emperor were depicted as political partners. This aspect might also indicate that it was not the Tetrarchs, but the Roman senators, who were the driving force behind this new conceptualization of the Forum. The senators tried to convey to the Emperors, through the medium of architecture, what kind of political cooperation and recognition they hoped to attain for the city of Rome as the primary Imperial residence. The absence of the Emperors from Rome (with the exception of the usurper Maxentius) and the fading significance of the old capital were certainly driving factors of the urban decoration of Rome during the period of the Tetrarchy. In this respect, it seems possible that these factors were crucial forces behind the “reinvention” of the Forum. In contrast to his predecessors and opponents on the throne, Maxentius chose Rome as his Imperial residence and consequently emphasized the central significance of the old capital. Accordingly, he was involved in the design of important public spaces in the city and used these spaces for purposes of Imperial representation. On the Forum, the area of the former Comitium rose to prominence once again under his reign. 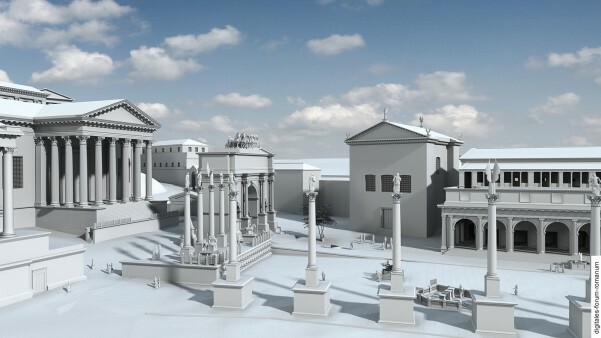 By erecting the statutes of Mars and of both of the founders of Rome, Romulus and Remus, there, the area of the former Comitium was depicted as a memorial site for the mythical origins of the city. However, all the efforts of the city senators and Maxentius to preserve the old significance of Rome as the capital of the Roman Empire would ultimately fail: In 312 A.D. Maxentius died in the battle against Constantine and in 324/330 A.D. Constantinople was chosen as the residential city of the new sole ruler, Constantine. This final blow to Rome’s political significance was to have far-reaching consequences for the further construction and use of the old Forum (see Late Antiquity I & II).